When Image Comics announced that the second printing of DEADLY CLASS #3 featuring a new cover would be made free to retailers a flurry of orders ensued, with many retailers matching their initial first printing orders. The third issue is now slated for a third printing to keep up with customer demand. Retailers have been selling issues of Rick Remender (BLACK SCIENCE, Uncanny Avengers) and Wes Craig’s breakout series DEADLY CLASS hand over fist. The popular new series follows a group of teens in 1980s San Francisco who are training to be assassins in the most brutal high school on Earth. Here, the world’s top crime families send the next generation of killers to be trained. Murder is an art. Killing is a craft. At Kings Dominion High School for the Deadly Arts, the dagger in your back isn’t always metaphorical, nor is your fellow classmates' poison. DEADLY CLASS #1 is still in stock and available to order with Diamond Code JAN148238 and—for those just discovering the thrilling new series—the second printing of issue #2 is available to order with Diamond Code FEB148225. Image Comics is pleased to announce that the third issue will be going back to print to meet customer demand. 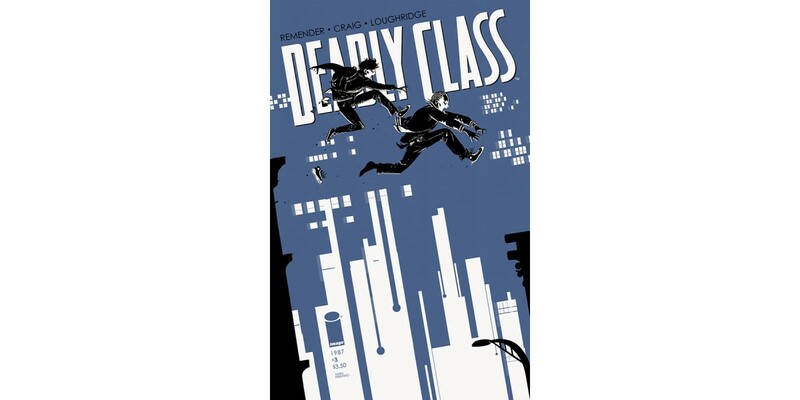 The third printing of DEADLY CLASS #3 (Diamond Code MAR148302) and will be released on 5/28. DEADLY CLASS #4 hits shelves tomorrow and can be ordered with Diamond Code FEB140597.